The Rev. Dr. Janet Lombardo was welcomed to St. John's in June 2018 to serve as our Interim Rector and Clergy Oversight. She will lead and guide us during our transition, following a call in March 2018 of our Rector of eleven years to serve another parish. The Rev. Dr. Janet Lombardo has been an Episcopalian all her life. She and her family moved to Concord, NH in 1993 and have enjoyed living in New Hampshire ever since. Janet has a Doctorate of Ministry in Congregational Development. She has worked at many parishes throughout New Hampshire and was a Hospice Chaplain for the Concord Regional Visiting Nurses Association. Her last church was in Claremont, NH, where she served as a redeveloper/Interim for a Lutheran/Episcopal partnership. She currently works as a consultant for Episcopal Church Foundation, helping congregations with Strategic Solutions. Janet is an advanced Scuba Diver, enjoys traveling, watercolor painting and quilting. Music has always been an important part of worship at St. John the Baptist. We have a wonderful pipe organ and piano, both of which are used regularly. We also use percussion instruments played by our talented and enthusiastic volunteers regularly in the summertime and for special occasions during rest of the year. Variety in the styles of hymns and other music helps to make worship an uplifting and meaningful experience. Linda and I moved to NH from our life long home in CT in the summer of 2001. Two years later, after just one Sunday at St. John’s, we knew were home. After 3 months of sitting in the back pew, I moved to the organ bench in the front of the church and have been there ever since. 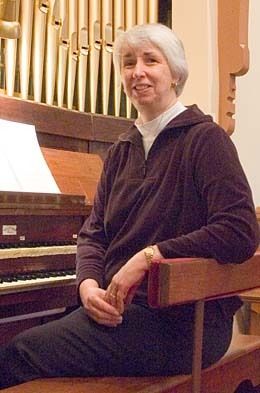 Linda accompanied the choir until it disbanded a number of years ago and continues to add her special touch to the music and worship life of this church. My love of church music began in the church of my childhood, a large Congregational and UCC church in New Haven with a magnificent pipe organ played by a succession of organists from the Yale School of Music. I can remember being thrilled by the beauty and power of church music at a very young age and I only wish I had known then that the organ was an instrument which could be learned just the same as the piano. As a young child, it seemed that the organist magically appeared on the organ bench each Sunday, never to be approached, and only listened to in awe. Our life is filled with the goodness of family and friends including a wonderful daughter and son-in-law, their two beautiful children, and an amazing Irish Wolfhound. After a recent move to Maine we continue to travel to St. John’s as we love living near the ocean while still enjoying the pastoral beauty and peacefulness of the countryside here. Linda and I love providing music for the worship services on both piano and organ. The fulfillment we find in the loving fellowship of St. John’s provides just the right finishing touch for our life in coastal Maine. The Vestry of an Episcopal Church is the governing authority for all temporal (non-spiritual) business of the parish: a bit like a Board of Directors. The Vestry is elected by members of the parish. Its primary responsibilities are to take care of the parish finances, care for and maintain parish facilities and choose parish leadership, including interviewing and calling the Rector, as required. The Vestry also assists the Rector in the nurture and extension of the church to serve its members and as Christ's hands and feet in the world.